PuzzlAR: World Tour is a jigsaw puzzle game realized in augmented reality. There are three different landscapes that the player needs to piece together, including the Statude of Liberty, Taj Mahal and Saint Basil Cathedral. I have to admit that it's a great ride seeing all those new Apple AR ARkit games being realized in Augmented Reality. We've already seen some first-person shooters, adventure, and survival games, so here is another genre, puzzle, that I think works great for AR. 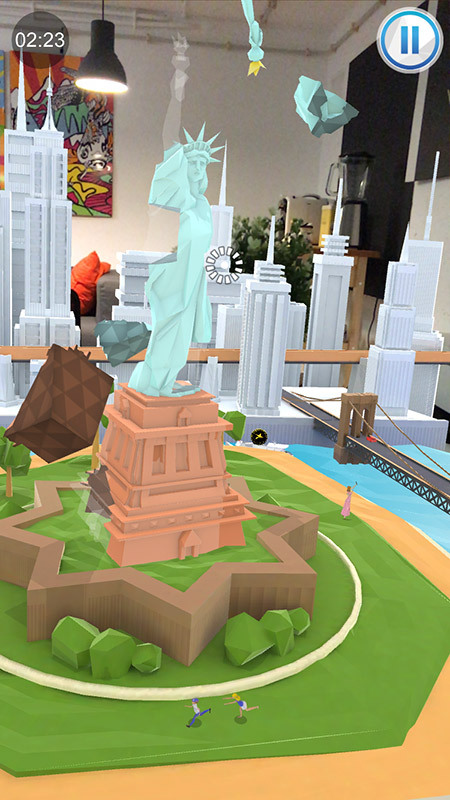 Puzzle AR: World Tour takes the classic jigsaw puzzle games and realizes them as a 3D puzzle game in Augmented Reality. I love playing those type of games since I was a child. I have to admit, I haven't played a jigsaw puzzle game for quite a long time. The last time I remember is playing one with my niece when she came for a visit. Puzzle AR: World Tour gave me a reason to try it once again and see how this type of game is played in AR. Like any other AR game, you choose the flat surface where you want to play the game on. The game than draws the landmark and the main 3D structure onto that area. After that, the game just takes the 3D puzzle pieces and scrambles into the air. Now it's up to you to aim the pointer to a puzzle piece and put it where it belongs. The area that should be completed is marked as a transparent area. The gameplay is really simple and straightforward and the controls are very simple and intuitive. Of course, nothing stops you from looking at the puzzle from any angle. All you need to do is just move around, tap the puzzle piece and just aim your iPhone or iPad to the right direction and move it to place the piece where it belongs. There is also an option to pinch to enlarge or reduce the size of the puzzle area on the flat surface, which is a useful feature and once enlarged, you can even sport the small animations that the developer added to make the puzzle world feel more dynamic and alive. PuzzlAR: World Tour, like its name, suggest, features puzzles based on popular buildings in the world, including the Statute of Liberty, Taj Mahal, and Saint Basil Cathedral. You get to experience the surrounding around the place and construct back the main structure in each area. It's not a complicated puzzle and it's made only of a few pieces. I personally would have liked to see some more complex and challenging puzzles. I think the developer should add an option to allow players to choose a number of pieces they want to construct the buildings from, rather than having a fixed number of pieces. I think this can be really cool and add to the replay value of the game. 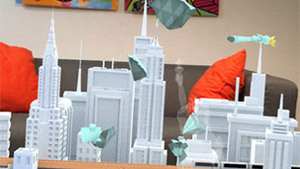 By the way, PuzzlAR: World Tour was first released for Microsoft HoloLens. I've checked Microsoft store, the game is there and you can head on to the store and download it for free. As of the time of writing, ARKit version is not for free. I've also read that the developer plans to add a new landmark each month and it also allows players to vote on new content so they can decide which landmark they want to play next. 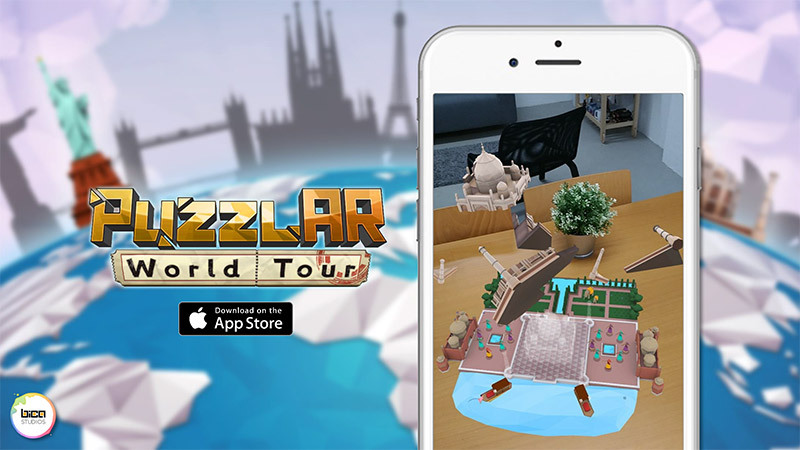 I think PuzzlAR: World Tour is a great puzzle game that really shows how Augmented Reality can enhance some of the classic games that we all used to enjoy in the real world. I think it has a potential to become even more entertaining and challenging than it is at the moment. For example, for the next content, players will have the option to choose between Brandenburg Gate, Forbidden City, Palance of Westminster and Himeji Castle. The game supports all the iPhones and iPads that come with iOS11 (and up) and have ARKit support, which as of the time of writing those supported devices are: iPhone 6s/6s Plus, iPhone 7/7 Plus, iPhone SE, iPhone 8/8 Plus, iPad Pro and iPad (2017). More details information can be found on the official Apple.com website. I think the experience is well worth its price and I do hope to see more cool new features added to this game like difficulty levels, so it will appeal more to the more mature audience or those who love playing hard and challanging games.